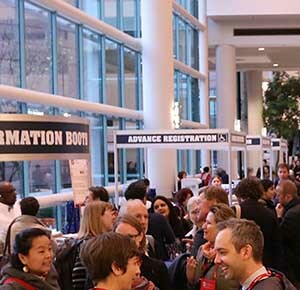 The Graduate School Fair takes place each year at the AAA Annual Meeting on Saturday from 12:00 to 4:00 p.m.
Students: The Graduate School Fair is a great opportunity to speak with directors representing programs from around the country. Students hoping to attend the Graduate School Fair and the NAPA/AAA Careers Expo may consider attending the Meeting at a discounted weekend rate. Registration information can be found here. Graduate Schools: This is an opportunity to publicize your program, network and meet prospective students. Space is limited, and Department Services Program partners get priority. An invitation is typically sent to partner departments in early October. If you have any questions, email Daniel Ginsberg.